This week’s open call: I submitted work to the Open Call of the Looking at Painting journal. December 25th, 2013 found me in the intensive care unit of a hospital in my home city of Athens, Greece. It was Christmas Day and there I was, instead of celebrating with my family and enjoying one of my mother’s delicacies, I was lying in one of the beds of the respiratory ward. How did I get there? The answer may not be what you expect: Art. Sure, if I wanted to be more literal I should perhaps refrain from blaming art and instead blame it all on my frivolous behavior. But the fact of the matter is that it was indeed my precarious involvement with art that landed me this Christmas gift. A recently adopted drawing method in combination with my failure to take all the necessary protective measures it called for brought this on me. Thankfully I came out of it unscathed (and wiser); What’s more, I had a “trophy” to show for what I’d been through: What I was working on when I got sick: Thirty-six blue moons. This was the last work I finished in the year 2013, but it felt as if it were the first one in a long time, maybe because its creation coincided with a newly acquired sense of self-coherence that came after a long period of confusion (see part II). It was also the first work I submitted in response to an artist call after my 2014 new year’s resolution to get my work out there. My desire to take this particular work out of the workshop was probably what gave the final push for that first application to happen. Not very long after the submission I received the news that it was successful. The opportunity had been posted by an independent curator and it involved participating in a group show in London. When the news came I was overwhelmed. This was a huge morale booster, especially following a lengthy “exhibition drought”, and was interpreted as an early confirmation of my newly implemented strategy. I found it kind of entertaining, and not lacking a generous dose of refreshing irony: The work that not so long ago had landed me in a hospital bed was now landing me an exhibition abroad. Things did come at a price, it seemed. But, as I would find out, refreshing irony aside, I was also in for a generous dose of disenchantment. 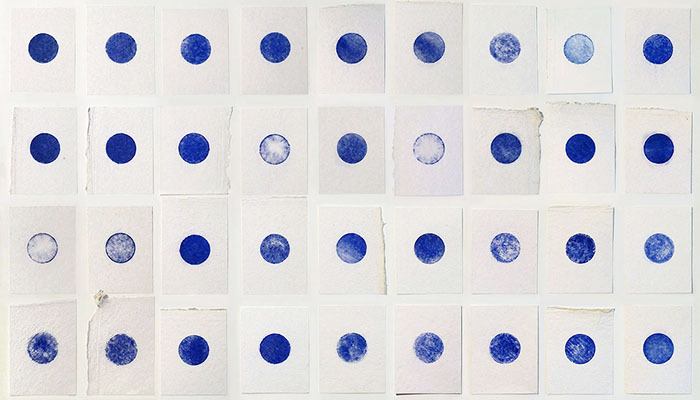 The good: My work was benefited in unexpected ways and, as often happens, the blessing came disguised as an insurmountable difficulty: Thirty-six blue moons, a work playing with the concept and form of the calendar, consisted of 36 drawings set in calendar structure. When news of its success came in, the individual drawings weren’t yet mounted on the surface that would carry them. The work was more or less still open. This proved to be a good thing. Faced with the logistics and considerations of transporting a 1.5 x 1 m frame to the UK from Greece I realized this was out of the question. The cost of transportation, all of which had to be covered by me, not to mention the potential cost of damage (it was certainly possible that the glass would break in transport), also to be covered by myself, all these added to the costs of travel and subsistence for over a week (thankfully a friend living in London had graciously offered to be my host) was turning the whole enterprise into a science fiction scenario. Where is the “good” in all that, you might ask. The good was that being faced with what seemed to be an impasse in the beginning forced me to find a solution that eventually led to the work itself evolving. I finally flew to London with the work securely packed in my carry on. In the days preceding the exhibition, Thirty-six blue moons evolved into an artist book in a process that not only didn’t compromise the vision I had for the work but proved to be the continuation of its creative process. If one comes to think of it, there are always rules and limitations in the workshop, often set by us to function as catalysts during the creative process. In this instance it was this logistical problem playing the role of this limitation that had to be overcome creatively. The challenge was met not only by harnessing the best possible results for the work but also with the best possible outcome for my budget. The bad: This was an international call for an exhibition held in London. Meaning that the artworks would come from all over the world. Therefore shipping the selected works to London and back was a logistical prerequisite for the exhibition to be held. This in turn makes the works’ shipping costs by nature an integral part of the exhibition’s budget. However, these expenses, which are considerable, were to be paid by the artists themselves. When asked whether the works would be covered by an insurance the curator gave me no clear answer, other than that once she received them the works would be “under her care” and while in the gallery they would have “public liability insurance”. Reading the terms stated in the contract between the gallery and the organizers, I understood that this didn’t amount to much. There was no guarantee whatsoever that the artist would be compensated in the event of damage or loss of his/her work. The Liability section of the contract read: “…the Gallery shall have no liability whatsoever for any theft, loss, damage or destruction (including incidental losses) to or relating to, artwork, exhibition elements and personal property”. Doing some research I found out that the lack of insurance coverage in international exhibitions was not an uncommon occurrence at all. Quite the contrary, at times even prestigious venues left that aspect unfulfilled. This realization served as a kind of perverse reassurance for me to put this issue aside and go on with the show. The ugly: I think one of the worst scenarios for an artist when his/her work is shown in a group show is for that show to take the form of something that doesn’t represent him/her. Sometime after I learned my work had been selected I found out that the number of participants was no less that sixty. No indication of the show’s scale was given in the initial call, and combined with the fact that there was an exhibition fee of 60 GBP ($100) to be paid in order for the successful applicant to be included in the exhibition, that didn’t have a good ring to it at all: Was this some kind of predatory “opportunity” luring artists, eager to participate in a London show, into an exhibition that provided them with no essential career value, while incurring high costs that they would be called on to cover? I wanted to show this work and looked forward to experiencing this to the end regardless – this would be the first time I’d travel abroad on such an occasion after all – so I didn’t let these doubts deter me. Unfortunately, they were confirmed. Walking in the gallery for the first time, when the works were being set up, was when I received the first actual confirmation of the negative signs I had been getting. There was no coherence in this assortment of works, no apparent connection between them or between them and my work. I was under the impression I had walked into the wrong gallery, until I spotted the curator, whom I recognized from a photo posted in the initial artist call. I wondered if the other artists stood frozen like me when they first walked in. I snapped out of this pretty quick. I was there after all, Thirty-six blue moons was there, and I had to get to work. Plus, deep down I knew that what I was facing at that moment could in fact have been foreseen. So I decided not to worry too much about the incoherence I found from that point on. But at the same time I knew that this was an indicator of the show’s questionable value and it also posed questions about the motivation behind it. I would have to be on my toes until this was over, since failure to provide for the show’s aesthetic and conceptual coherence made me think that a lack of professionalism would be demonstrated throughout. Regardless of the fact that this venture provided me with little to no value professionally, I do believe its overall effect at that time was constructive: I gained indispensable experience just when I needed it, I did something new that pushed my practice further leading to a breakthrough in my work, and, maybe most importantly, I met a couple of fellow artists with whom I have a valuable exchange to this day. – When something looks unprofessional it usually is all the way through. If the person in charge of the “opportunity” can’t use language correctly or is vague on essential issues, odds are there will be larger and more serious failures in their performance along the way. – Be skeptical, if not dismissive from the get go, of “opportunities” essentially funded by the artist. As I realized the fee the artists were paying for their participation was going to cover the gallery’s rent. One can’t expect any real career boost from these kinds of setups. – There are two kinds of opportunities: One-sided “opportunities” tailored to serve the organizers’ agenda, and true opportunities that benefit both parties. When the artist feels like he/she is only a means to an end, his/her opinion is not respected or even taken into account, or that they are part of something they didn’t opt in to, they should leave early and cut their losses. If you are starting out, trust your instincts and read the signs. If you find yourself at the receiving end of this kind of opportunity, make some friends along the way, because this is one of the few valuable things that remains from any venture. And in the end, look back on the experience and evaluate. Do you have the experience of a similar kind of opportunity? When was the moment you realized it wasn’t going to provide you with the value you expected? Was anything gained from this regardless?